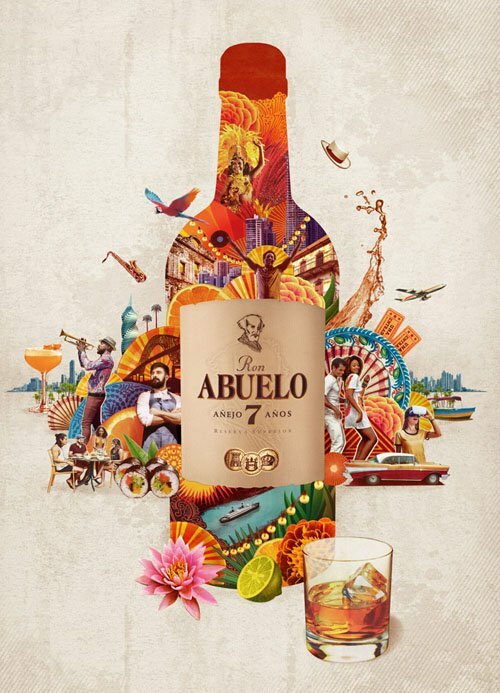 Martin O’Neill worked with ad agency Purple in London to create these two fabulous ads for Abuelo Rum. The brief was clear yet wonderfully flexible: Panamanian culture, Food and chefs, Wildlife, Fauna, Creativity, carnival, music & dancing, travel, outdoor dining, experiences. Martin had two weeks to create two versions. Pretty intensive and everything had to be created in layers as the pieces would be animated. Martin is an ardent proponent of the hand-made collage process but for this project he would need to mix his hand cut elements and treat them individually in the real world. Once ready, he then scanned them all in and created the collages digitally. 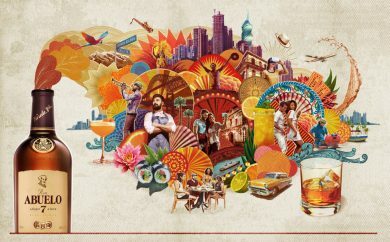 The agency and client gave Martin a lot of freedom compositionally and he enjoyed working with the punchy but muted colour pallets associated with the Abuelo Rum Brand. Martin excels in creating very complex collage and approaches each project as a unique problem to be solved. Check out his portfolio page at www.threeinabox.com/oneill/.